After you install Outlook 2010, Outlook 2013, or Outlook 2016 and try to send mail using the File, Send by email command in other applications, Outlook may not be recognized as the default mail client. You are using Outlook 64-bit and 32-bit programs can't "see" 64-bit programs. Installing the application AFTER installing Office. The fix: repair Office. First, in Outlook, go to File, Options, General. Is Outlook set as the default client? Next check the Windows settings. Verify Outlook is set as the default Email client at the top of the page. Open Control Panel and search for Default Programs. Select Set Default Programs link. Choose Microsoft Outlook from the list of programs. Click "Set this program as default". If the affected program was installed after Office, try repairing the Office installation. Using 64-bit Office is not recommended unless you need large (2GB) file support in Excel or Access. There is no benefit in using Office 64 bit for "normal" users. Also, you cannot mix-and-match Office 'bitness' - you need to use all 64-bit or all 32-bit Office applications. See 64-bit editions of Office 2010 for Microsoft's recommendations. If you are using Office 64 bit, check this registry key and create it if it does not exist. If you are using Outlook 2010 Home and Business C2R, you should uninstall it then log into the download site and download the MSI. This will install the traditional Office suite, which is recognized by other applications. Note: All Office 2013 suites sold "retail" are "click to run". It was designed to work like the traditional MSI installation. Only certain volume licenses include the MSI installation. If you choose to use the following registry hack, you do so at your own risk - it puts Outlook into an unsupported mode. If you have problems with Outlook, you need to remove these keys before troubleshooting. Our recommendation is to use 32-bit Office. Right click on the Mail key and Export a copy for backup. 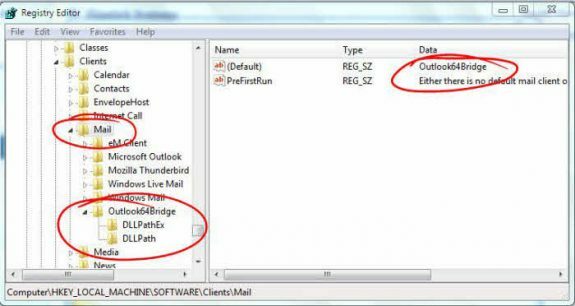 Next, right-click on Outlook64Bridge and create a key under it called DLLPath. Right-click again and create a key called DLLPathEx. have it set as default in Outlook 2016 under the "General" tab.Open up Internet Explorer. Click open the tools sprocket in upper right. In the sub-menu pop up, select "Manage Add-Ons." When this window shows, click on the "Accelerators" tab in left pane. 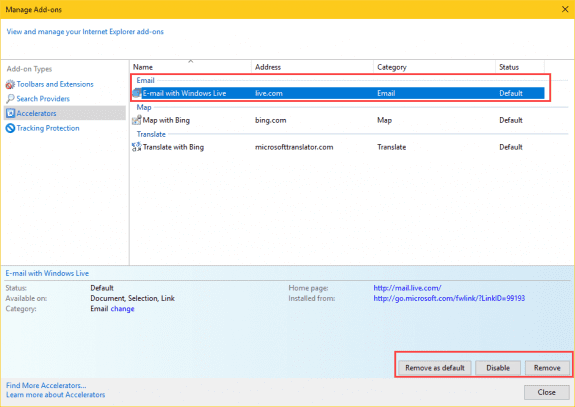 In the right pane, DISABLE "E-mail with Windows Live". That annoying message is now gone. Because Windows Live mail client is no longer available, you can either disable, remove, or remove as default. I am receiving this error when trying to run Outlook 97 in Windows Vista—even with administrative privileges. I followed the applicable steps in the article, but they did not resolve the issue. There is also no key at HKEY_LOCAL_MACHINE\Software\Clients\Mail\Microsoft Outlook; therefore, I cannot follow Microsoft's own advice to delete this key. This wouldn't apply to your version, but i would add that key and see if it helps. I don't recall if i have anything in my notes about this version and newer builds of Windows, but will look. Is there a reason you are using outlook 97? If buying a newer version of outlook is not in the cards, eM client is free for up to 2 accounts and is a very good, secure replacement for outlook. settings>>Apps>>Apps & reatures>>>MIcrosoft Office Desktop "remove"
have it set as default in Outlook 2016 under the "General" tab. Open up Internet Explorer. Click open the tools sprocket in upper right. In the sub-menu pop up, select "Manage Add-Ons." When this window shows, click on the "Accelerators" tab in left pane. In the right pane, DISABLE "E-mail with Windows Live". That annoying message is now gone. I have this question:. On my RDS server which is Windows 2012 R2, I had installed Office 2016. Outlook 2016 is no longer able to connect to our exchange server running 2010 after applying security roll up 18 for Exchange Server. So the MS suggestion is to downgrade Outlook to 2013. I have done that on the RDS server and I removed Outlook 2016. I did not remove the other Office 2016 Pro programs. So now I need to make the Outlook 2013 the default email program so the users can send email from other programs. So if possible to get the answer to where do you set this in the W2012R2 server registry, I might can get this resolved. I have tried all the things listed by all the other people in this thread. other places, Internet Options, etc don't allow the change as well. I just need to get this working so help is so much appreciated. I believe you are correct - Crystal can't find outlook. Outlook still supports mapi, but some programs may need to be updated to work with the newest version of outlook. Also, some programs will only 'find' 32-bit outlook. Thank you very much for the prompt reply! I did forget to mention that Outlook 2016 is 32 bit as well as Crystal 2013. I am going to upgrade Crystal 2013 to Crystal 2016 and see if that helps. Hi I am using Office 365 64bit and every time I restart my pc and open outlook I get the following error "Either there is no default mail client or the current mail client cannot fulfill the messaging request. Please run Microsoft Outlook Client and set it as the default mail client." Please help. I have made sure that outlook 2016 is set to the default mail client. Are you using 32 or 64-bit office? Which Windows OS? You definitely shouldn't get this message opening outlook - but if an other program tries to open outlook and you are using 64-bit, it could happen. Try the instructions for outlook 2013, but change the version to 16. DIane, if I switched to 64 bit 2016 Office 365 and get the "either" error with apps such as Adobe when trying to send to email, should I try the reg edits under 2010 above? The bitness edit didn't help. it shouldn't be a problem to try those edits - but it might not help. Did you already try a repair? Yes i tried both repairs and then, manually uninstalled Office 365 (sheesh that took an hour) and then ran the uninstall tool also. Rebooting inbetween. Then I installed current channel 32 bit Office. Same problem. Also continue to have issue that the mail icon in Control Panel labeled correctly as OL 2016 but "Application Not Found"
Since I also had that issue with 64bit Office, must be something wrong with Windows itself re mail? btw, even though on my other 64 bit Office Win 10 machines, File Explore "send to" email fails with same default app message as most 3rd party apps do, talking with a MS tech who says his 64 bit Office works fine with File Explorer "send to mail." Is the procedure you described here for Outlook 2013 the same for Win10 and Outlook 2016? The message I get when the 32-bit software I use tries to generate an e-mail is "Either there is no default mail client or the current mail client cannot fulfill the messaging request. Please run Microsoft Outlook and set it as the default mail client." If I look at Default App settings it does show Outlook 2016 as the current default. Presumably this is a case of my 32-bit app not "seeing" the 64-bit mail client? Yes, it is the same for the newer versions. You'll need to change the version # in the reg key. They both pointed to:"C:PROGRA~2MICROS~1Office14OUTLOOK.EXE" -c IPM.Note /m "%1"
"C:Program FilesMicrosoft OfficeRootOffice16OUTLOOK.EXE" -c IPM.Note /mailto "%1"
Thanks for posting this. I'm sure it will help others.